Brief Physical Description: Gull is of Greek descent and slightly stocky, with gunmetal blue eyes, a fishtail braid and a two-tone matted pompadour. He looks like a former surfer that's let himself go in the physical but not the fashion department. Of course, he only dyes his hair with animal-friendly products and carries around everything he needs for his job in his fanny pack. Unlike the other vets working at Shipshape (the one other vet) he doesn't wear a labcoat, his excuse being that he has to be ready to drop everything and dive into a tank in case of an emergency; hence his bathingsuit and diver's shoes. Though the lax uniform policy at the aquarium has been kind to him and the way he chooses to dress, his seeming lack of professional decorum has been a longstanding point of contention with some members of the staff. Brief Personality Description: Gull radiates a warm and nurturing presence that fits his chosen occupation, but dresses and acts in a way that seems at odds with it. At a glance one would guess he's part of the show performers rather than a man with a veterinarian degree but despite his penchant for loud Hawaiian shirts and ostentatious hair, he is deeply invested in his work and unexpectedly knows how to handle dire or emergency situations. He is just as self-sacrificing as Herman is when it comes to the upkeep and care of the animals at Shipshape but is secretly insecure about his level of prowess, as he recently transplanted from a mostly informal volunteer operation to a professional workplace environment. The way he carries himself and lack of experience in a laboratory setting sometimes cause some people to believe he is, at least, lying about his qualifications and at worst, scammed his way into a job at the aquarium by putting on a "Crocodile Hunter" persona. 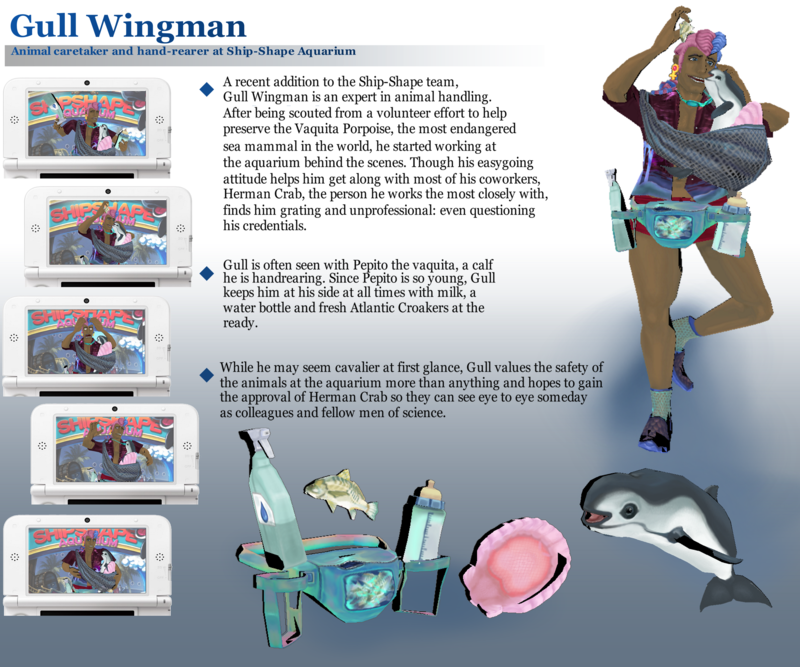 Connection to canon characters (if applicable): Gull is Herman Crab's coworker and whatever time he spends doing lab work or caring for the animals hands-on is normally spent with Herman. He acts as the funny man to Herman's straight man and seems like an expert at letting Herman's insults roll off him like water off a duck's back, but secretly yearns to gain his respect and for Herman to understand that despite their differing backgrounds and attitudes, he, like his coworker, has the best interests of the aquarium and the animals at heart. Brief Background: Though Gull is from Greece originally, he has spent most of his childhood and teenage years near the Gulf of California. Growing up very close to the coast and developing a passion for sea life, Gull started to devote himself from a young age to volunteer efforts concerning the Vaquita Porpoise. Most of his work revolved around breeding them and other endangered species in captivity, and he gained a reputation as an "Animal Love Guru" over time due to his success in the field. Shortly after getting his vet degree he was contacted by Shipshape, which was looking to fill a tank and wanted to scout him for his experience in hand-rearing vaquitas. He traveled to California by boat with a young calf in tow and took up his current position at Shipshape. Disclosure: I initially used the topology of Marlon Rime's model as a reference for building the face/used the other Dual Destiny character models as reference for his height and how the texture sheets are constructed, but I went over the topology several times since initially modeling and I doubt he resembles any of the DD models at this point. 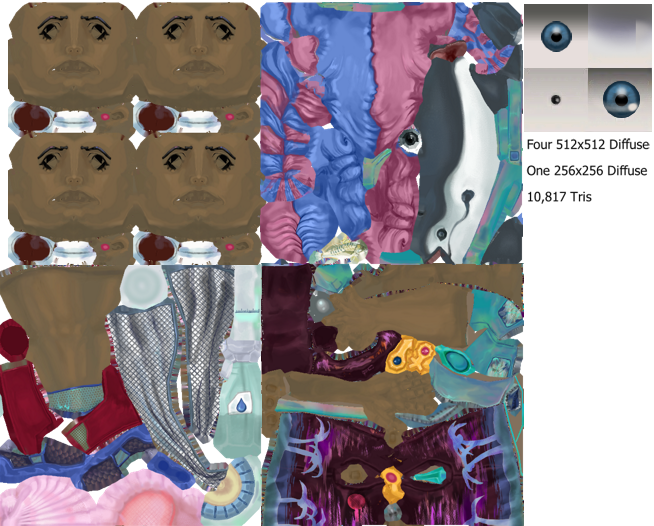 Please right click/open image in new tab to see those 3DS sprites a little clearer.